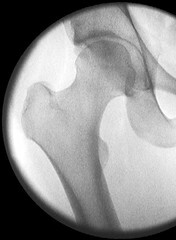 Hip X-Ray (Photo credit: alvaroprieto) No, this is not Aidan’s hip and I have no idea what you’re really looking at. Today I’m thankful for the affirmation that I have great doctors. There can be a rift between patients and the medical community whether it be from fear, communication barriers, or power disparities. Just last week I ran across both a medical professional and another parent who know Dr. Hip who is performing Aidan’s surgery in March. The medical professional assured me of Dr. Hip’s knowledge and experience and the parent spoke of his great compassion. While a surgeon is someone I may have few visits with (pre-op, surgery, post-op) all of those pieces are important to me. His reputation precedes him whether or not he understands that each little interaction is being noted. Today I am thankful for this assurance – Aidan will be in good hands. Aidan Runs His First Marathon!! I’m not sure if your Dr Hip is the same as ours. We’ve been seeing Dr M (I think there are more than one Dr M’s at CHB in orthopedics) for over three years and absolutely love him. We first saw him looking for a second opinion. We knew at around age 3 his hips were headed in the direction of surgery, but we were seeing someone at Tufts and wanted to go to CHB since all our other specialist were there. Dr M was wonderful. He explained to us the benefits of waiting until he was older especially since his hips were stable vs. doing it at age 3. We waited and he is now almost 7 and his hips are now just starting to slip out further. He will be having surgery sometime early 2013. We’re having surgery in March. I’ve been pleased with the entire team there. I found a packet on info online with lots of information about surgery and healing and services etc. If you’d like me to send it to you, just send me an email. I hope things go well for you.